Photo from fire marshals observing wildfires in Palo Pinto County. Two wildfires are torching hundreds of acres near Possum Kingdom Lake. 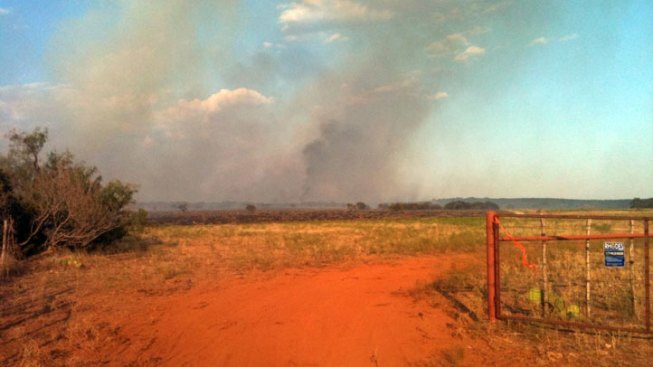 Palo Pinto County Fire Marshal Keiffer Harwell Jr. said a fire near U.S. 180 just east of Palo Pinto has burned at least 500 acres since it began on Wednesday. A second fire near the east side of Possum Kingdom Lake near Texas Highway 16 and FM 254 had burned at least 100 acres as of early Thursday evening. The fire jumped the fire line Thursday night, and crews were repositioning to combat the fire. No homes or buildings have been affected by either fire and there have been no evacuations at this time. Fire officials do not yet know the cause of the fires. Wildfires near the same area burned thousands of acres and destroyed more 200 homes in 2011.